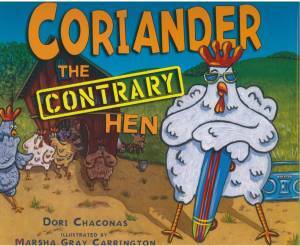 Book Flap Copy: Coriander is NOT like all the other hens. When Farmer Bucket says, "Go! Coriander stays. When Mrs. Bucket says, "Stay!" Coriander goes. Coriander is a very CONTRARY hen. When this stubborn h en decides to sit down in the middle of the road, traffic grinds to a halt. But no amount of honking and hollering will do any good. Behind the scenes: As a child, I visited my grandparents' farms with my family and one of the things I learned to do was to collect hens' eggs each day. Most were in the hen house, but there were a few contrary hens who'd lay their eggs in less obvious places--in the machine shed, or a cow stall, or tucked into the tall grass beside a fence post. It was a challenge to find them, and on more than one occasion a stubborn hen would scare me half to death by coming after me! Kirkus: A hardheaded hen plumps down in the middle of the road and brings traffic to a screeching halt in this rhythmic rural ruckus. Thoroughly used to doing just what she's told not to, Coriander settles in on a pile of grass with a "Coop and Garden" magazine—which, in the cartoon illustrations, is joined by a dish of candy, an umbrella, sunscreen, a radio and other leisure gear as the tale goes on—and despite plenty of scolding, refuses to give way as trucks, cars and even a school bus pile up. Featuring as a crowd-pleasing refrain variations on "With a ruffle of her feathers / and a sharp look in her eye, / Coriander cackled a discourteous reply, / CLUCK CLUCK TRUCK!," Chaconas' text is paired to hilarious views of a small hen with a big red comb and an even bigger attitude. Ultimately persuaded by a bit of reverse psychology from a canny lass ("Do NOT get out of the road"), Coriander finally swaggers back to the henhouse to roust out its occupants and construct a cushy new nest. Admirers of Anita Jeram's Contrary Mary (1995) will find Coriander an even tougher bird.